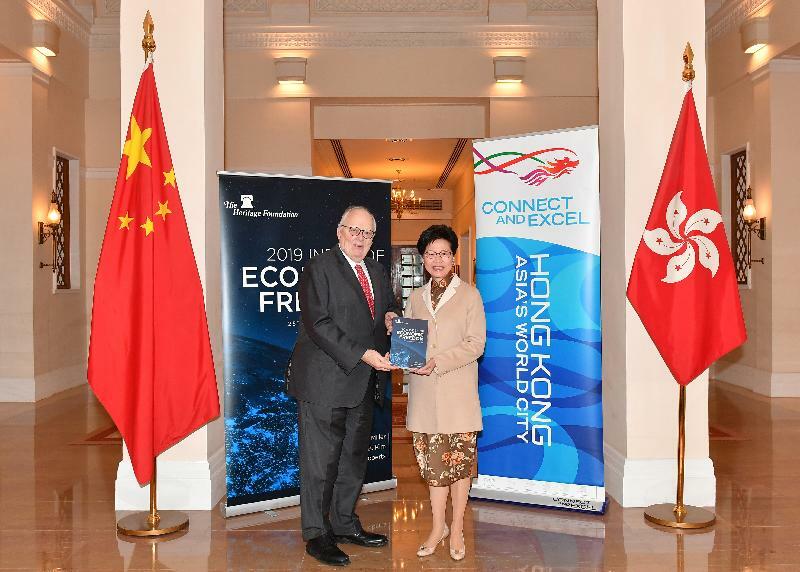 The Chief Executive, Mrs Carrie Lam, this morning (January 28) met with the Founder of the Heritage Foundation, Dr Edwin Feulner, at Government House and received from him a copy of the recently published 2019 Index of Economic Freedom report. The report again ranked Hong Kong as the world's freest economy, a title which Hong Kong has received in each of the past 25 years since publication of the Index began. Mrs Lam said she was very pleased to meet Dr Feulner, as well as the Director of the Center for International Trade and Economics of the Heritage Foundation, Mr Terry Miller, and the Research Manager of the Center for International Trade and Economics and Editor of the Index of Economic Freedom of the Heritage Foundation, Mr Anthony Kim, again in Hong Kong and expressed her gratitude to the Heritage Foundation for affirming Hong Kong's commitment in upholding the free market principles over the years. She said she was pleased that Hong Kong's overall score remained at 90.2 in this year's report, making it once again the only economy to attain an overall score higher than 90. 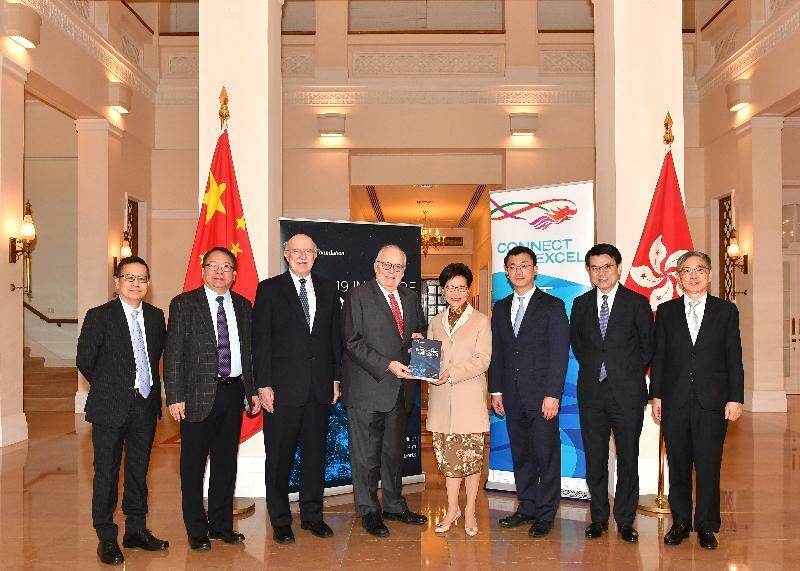 The report recognised Hong Kong's economic resilience, high-quality legal framework, low tolerance for corruption, high degree of government transparency, efficient regulatory framework and openness to global commerce. Mrs Lam said that with economic globalisation and increasingly keen competition between cities in the region, Hong Kong has to keep moving forward. Adding that Hong Kong will continue to facilitate free market operation and improve the environment for doing business, including the launch of the tax concession measures in this financial year, she said Hong Kong will give full play to its unique advantages and enhance its international competitiveness to consolidate its leading status as an international city and financial centre. However, Hong Kong's rating for "judicial effectiveness" in the 2019 report is lower than that of last year. The report said that the judiciary is independent, but Beijing reserves the right to make final interpretations of the Basic Law, effectively limiting the power of Hong Kong's Court of Final Appeal. Disagreeing with this view, Mrs Lam emphasised to Dr Feulner that the power of interpretation of the Basic Law is vested in the Standing Committee of the National People's Congress (NPCSC) and that the arrangement of enabling the Court of Final Appeal to exercise the power of final adjudication over court cases and the NPCSC to exercise the power of final interpretation of the Basic Law is a unique arrangement which realises "One Country, Two Systems" and a high degree of autonomy for Hong Kong. The relevant constitutional order has been implemented fully in Hong Kong since its return to the motherland, ensuring the city's prosperity and stability. She said that, as pointed out by the report, judicial effectiveness requires efficient and fair judicial systems and that the Hong Kong Special Administrative Region's independent judicial power and the power of final adjudication are protected by the Basic Law. The fairness and impartiality of the judiciary, which is free from any interference, are beyond doubt.